Positioned between Omaha and Gold beaches just 6 miles north of Bayeux, this gun Battery was 15 miles east of its sister emplacement at the Pointe du Hoc, but just as dangerous to the Allied shipping in the channel. On D-Day this was the first German emplacement to open fire on the allied Navy but didn’t manage to sink or even hit a single ship. The troops stationed at Longues sur Mer lacked the motivation to fight to the death as Hitler had demanded and the position was finally silenced by the Allied Naval Forces in the late afternoon of D-Day with the troops surrendering on June 7th to the British Devonshire Regiment that was moving east towards Port en Bessin from Gold Beach. The gun emplacements were located about 300 yards behind the cliff to hide them from Allied reconnaissance. 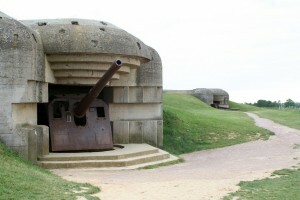 This battery today is one of the only heavy gun batteries in France to still have its original guns in their bunkers and illustrate how impressive these positions were and how much effort the Germans expended in their defence of the coast of Fortress Europe.